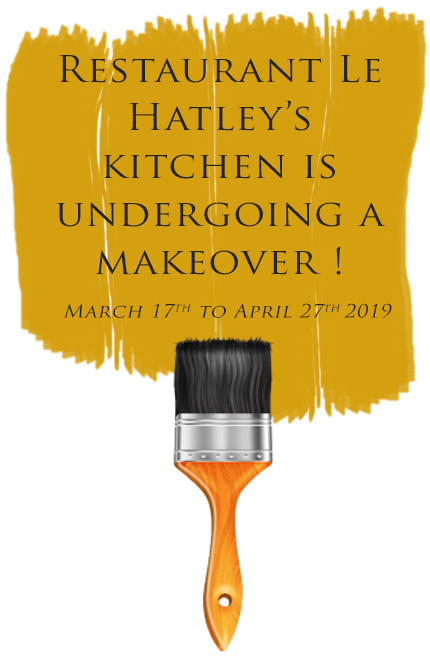 From March17th through April 27th, Le Hatley’s kitchen is undergoing a makeover! With our new team in place, we have decided to modernize our facilities in order to offer our guests a gastronomic experience of the highest quality! Breakfast, lunch and evening services will be served at the Tap Room during this period. Visit now Le Tap Room page to discover our brand new evening table d’hôte menu created by our chefs! For up-to-date news and specials, make sure to follow Manoir Hovey on social! The very spacious Vista Suites (the Heron Suite – 1400 sq. ft. and the Oriole Suite – 1200 sq. ft.) are perched atop a ridge overlooking the Manor and provide sweeping 180 degree views up and down the lake. These romantic refuges enjoy their own landscaped grounds with swimming pool plus individual hot tubs for each suite. The Suites are appointed in a more contemporary style with over-sized bedrooms and bathrooms complete with heated floors and steam showers. per day for lodging, including on-site activities. per day, including lodging, fine cuisine dinner, gourmet breakfast and on-site activities. *Rates based on double occupancy. 10% upcharge applies on Saturdays. Best rate guaranteed.No Resort Fee. Mid season: January 3rd 2019 to May 30th 2019 and October 15th 2019 to December 19th 2019. High season: May 31st 2019 to October 14th 2019 and December 21nd 2019 to January 2nd 2020.